Many of us will spend part of this Memorial Day weekend at a cemetery, visiting the graves of relatives, placing wreaths or flags, or just remembering the generations of sacrifice represented by the rows of marble and granite stones. It is, as others have suggested, altogether fitting and proper that we should do this. 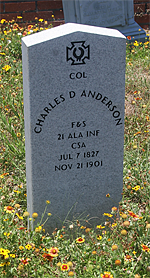 In a cemetery near my home there’s the grave of Colonel Charles DeWitt Anderson (1827-1901). His grave is marked solely by a modern, VA-issued headstone (right), listing his name, rank, regiment and birth and death dates. Those notations mean little to the casual passerby, and I doubt many people who pass Anderson’s plot will bother to look further into his story. Anderson’s best-known Civil War service is his defense, and subsequent controversial surrender, of Fort Gaines at the entrance to Mobile Bay in August 1864. The capitulation of Fort Gaines enabled the West Gulf Blockading Squadron, under the command of David Farragut, to then focus its attention on Fort Morgan on the opposite side of the channel, which Farragut successfully passed soon thereafter. Anderson’s wartime record is a significant and active one, if not especially glorious. When he was a boy, in 1839, his family emigrated by sea to the newly-established Republic of Texas. Anderson’s parents died at sea, and he and his brother were left orphans in a new land where they knew no one. They were adopted and raised by the rector of the Episcopal church here. He left West Point after his freshman year, having struggled academically, but eventually received a direct commission into the artillery in 1856. After the war, he used his engineering training in the construction harbor and river improvements for the government. After settling in Texas he served two terms as the city engineer for Austin. 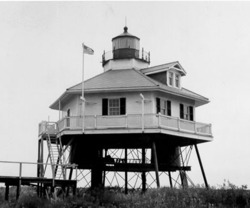 After moving to Galveston, he served as engineer on a new U.S. customs, house (now demolished). Anderson spent the last six years of his life again on the federal payroll, as keeper of the Fort Point Lighthouse. Colonel C. A. [sic.] Anderson, the venerable keeper of the Fort Point light house [right] , died yesterday morning at 10 o’clock at the light house, aged 74 years. The body was brought to the city on the tug Cynthia and is now at Levy Bros. undertaking parlors. The funeral arrangements had not been made last night pending the arrival of relatives from the interior. In the steel structural light house where the aged keeper and his devoted wife were imprisoned during the awful storm of September 8, 1900, he passed away after a lingering illness. He had suffered an attack of the grip shortly before the storm and never fully recovered his health. For six years he has cared for the Fort Point light and faithful to the last he insisted on remaining near where he could direct the mariners in guiding their ships into the harbor. The deceased was an honored soldier in the Confederate army and won distinction in the long struggle between the States. He lived a noble life and was honored and esteemed by all who knew him. So this Memorial Day, let us all remember that headstones simply don’t tell the full story. this is great stuff, andy. Added your blog to my blog roll. thanks for doing this. Very true. There are a lot of good stories out there, waiting to be discovered. i really like this format. may “borrow” this. I see you are a native Texan. We live there for 20 years, in Dallas and suburbs. Take care. Once again, your blog continues to inform and provoke additional questions. In this case: what is the meaning of the inscription “F & S” immediately below the deceased’s name? Reed, thanks for commenting. “F&S” refers to “Field & Staff,” meaning the headquarters component of a regiment, rather than an individual company. You see this notation frequently with officers, but occasionally with enlisted men, as well. A descendant sent me an image of the family which is, unfortunately, too faint to have been reproduced in these books. He married Lucy Hazard, daughter of a Washington DC police official. And I believe his brother to have been J. L. Anderson, a Mobile/Galveston merchant.. Thanks very much — I have More Generals, but never thought to look him up there.